Chancellor's Blog: Chicken with the Chancellor...say what? Chicken with the Chancellor...say what? It’s become a tradition since I became Chancellor at UIS a few years ago, that I have regular gatherings with students. Food, of course, is an essential part of those events and so (apparently) is alliteration! We’ve had Chocolate with the Chancellor, Chili with the Chancellor, Cheesecake with the Chancellor, Chimichangas with the Chancellor …. well, you get the idea. 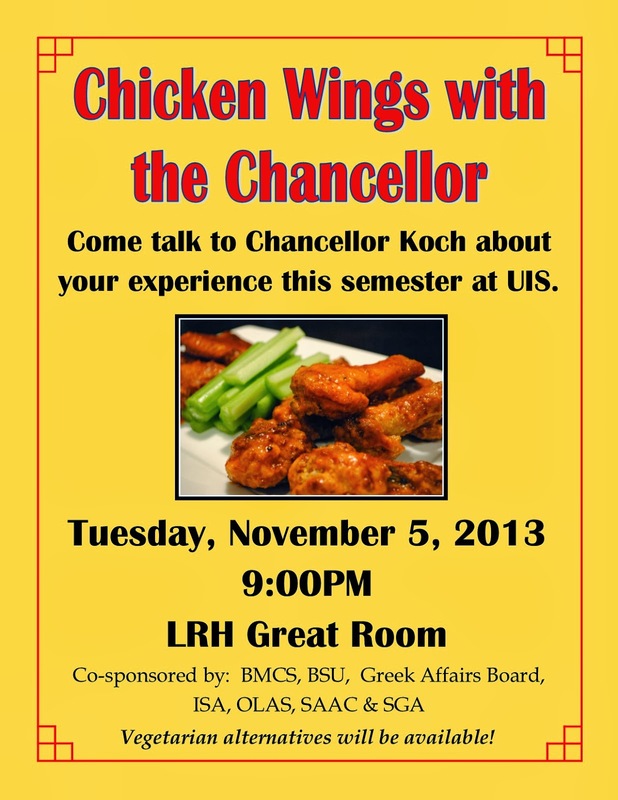 One such event is coming up next week and this time it’s "Chicken with the Chancellor”. Co-sponsors of the event are the UIS Student Government Organization and several other student groups. My thanks to all the student leaders who have been promoting this event on campus. Please come and join the conversation and have some wings …. or a vegetarian alternative. 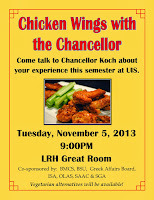 Chicken with the Chancellor starts at 9:00 p.m. on Tuesday, November 5, in the Lincoln Residence Hall Great Room. Who is taking those great UIS photographs? The University of Illinois is global!